Immigration statistics will never motivate us to welcome the foreigner into Canada or into the family of Christ. Something more fundamental has to occur. Most churches and individual Christians, I would hope, aspire to be welcoming to newcomers to Canada. However, moving from mere aspiration to tangible welcome first requires some honesty around our thinking. How we think impacts how we act (Romans 12:2). We begin at the beginning. The creation story establishes that God created all humans “in his own image” (Genesis 1:27). He makes absolutely no distinctions of value among people when it comes to his love. He expects us to treat others similarly. Note that Israel, the exclusively set-apart people of God, was commanded not only to take in the foreigner but to treat them with respect and equality (Numbers 15:15; Deuteronomy 10:19). Now think about who you see when meeting an immigrant. “In his own image” means you are to see them as created with the same value as you, and therefore equally deserving of respect, no matter if they have reconciled with God through Jesus Christ or not. This is because in Christ we do not evaluate others using the world’s standards such as ethnicity, religion, morality, or economic status (2 Corinthians 5:16). All are of inherent worth to him and therefore to us. When we view others as persons created in his image, we have common ground from which to start a relationship. Here’s a simple initial step to move from right thinking to right action: Be a good neighbour. The basic act of neighbourliness empowered by the Gospel message will not only be a positive welcome into Canada, but an introduction to another “immigrant,” Jesus Christ. We were all foreigners at one point. He welcomed us. 1. What does it mean to have inherent worth? In what ways are we made in his image? 2. 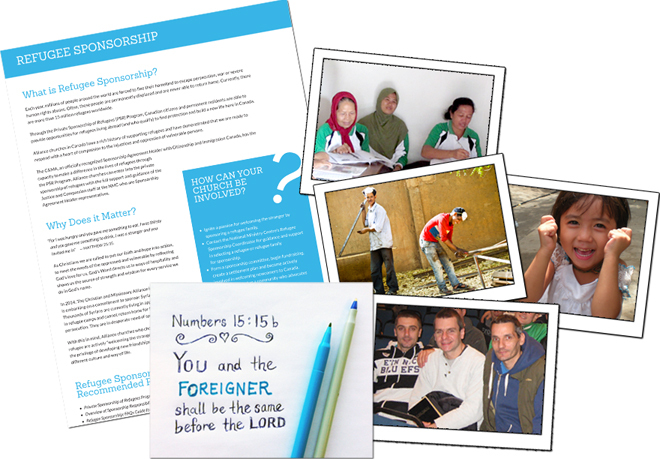 Is your church welcoming to newcomers to Canada? Harv Matchullis is Facilitator of Encompass Partnerships in Calgary, AB. Encompass is a mission agency designed for partners who are focused on taking the Gospel to the ends of the city where it has not yet gone or gained full expression. Harv’s passion comes from a ministry career of starting new ventures in Canada and internationally. Frontiers still exist.